Well, well, well look who has done it again. No surprise here, Corinne Michaels just knocked another one the park with Say I’m Yours. I am completely and utterly in LOVE with every single character in the books. Now I have a special love for these Hennington men, that is clear but I’ve got a ton of love going on for all the ladies and supporting characters also. This can be read as a standalone but I highly suggest you read the others simply because I wouldn’t want you missing out on a second of the big picture. The Hennington Bell Buckle picture as I call it. It’s a beautiful breathtaking one you shouldn’t miss a word of. Trent and Grace have been together forever, but not fully together. There has always been something holding Trent back but Grace can’t figure it out and she’s finally had enough. She wants it all. Marriage, family, stability, basically she wants what any woman would want with the man that they love. When she finally realizes that the same cycle keeps repeating itself she finally has had enough. Her walking away even though her heart didn’t may just be enough to wake Trent up but when tragedy finds its way back into the Hennington’s lives all the progress Trent has made is shattered and now he begins to question everything all over again. I don’t want to give too much away here. You know if you’ve read any of the other books by this author that she will pull out every emotion you have. Say I’m Yours is no different. I loved seeing all of the Hennington’s together once again as you know they are never far away from each other. This family is truly like no other. So are the people in the town of Bell Buckle as well that we’ve all come to know and love through this series. The loyalty, strength and solidarity between these individuals are bar none. I will go out on a limb here and say, Trent’s book was probably my favorite so far. So many things happened in this one, one I certainly didn’t see coming but I knew those involved would prevail. I simply am in absolute head over heels in love with this family. I adore this series and while I know we just got the last and oldest Hennigton’s story I have a feeling we will be seeing more of them down the road. I bow down to you Corinne. You continue to wow me with your words, your stories always evoke all the feels and even pull out some I didn’t even know I had waiting in the wings. 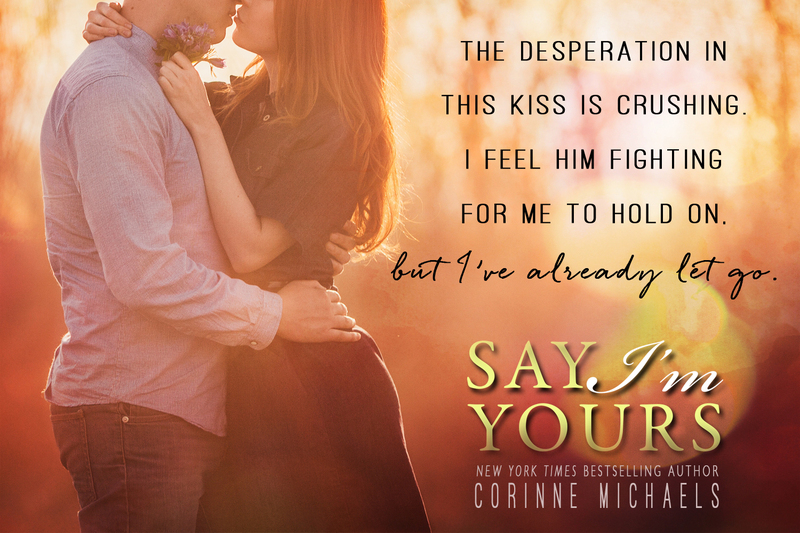 5 Blazing Hennington Men Stars for Say I’m Yours.